I know when spring has returned as the moles or gophers, as the case may be, have returned. Pushkin is on the trail of the offending varmits that leave piles of dirt everywhere. I am not sure what he will do if he ever catches one! What can we say? It is a battle of the yard–who will win? We are surprised he has not yet caught one. He will we are sure, then you will know the answer to your question. What does your Weim do? Labor Day is the perfect time to talk about the other than hunting jobs for the versatile Weimaraner. The Weimaraner (in general) finds itself in the thick of family life. They are never happier than when they are touching you. If they are not pressed against you, it is because they are engaged in some other activity. They are in-tune with their humans, and the environment. Sometimes this trait is an asset, and others it is a detriment. The Weim’s attachment to the family is well known, and documented. 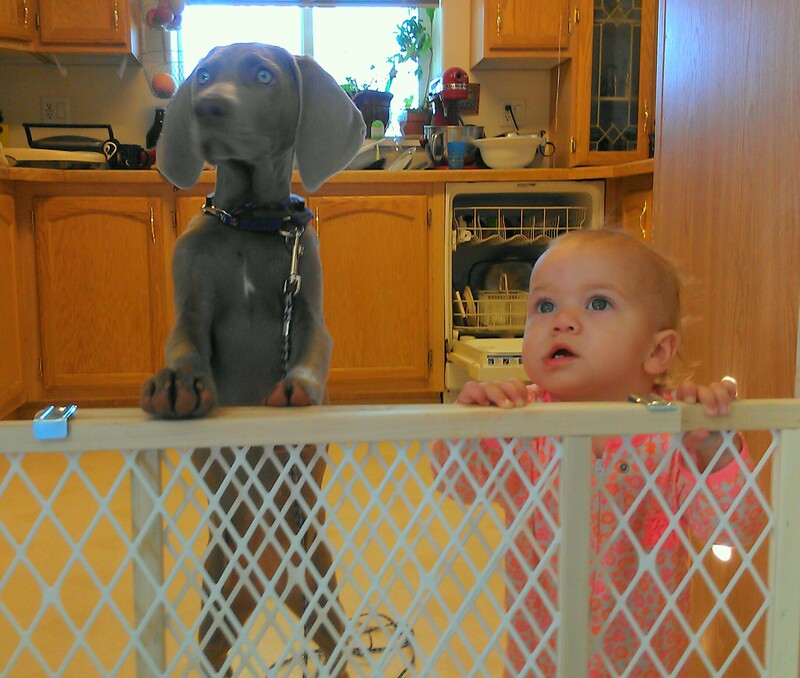 One job a Weimaraner might find is babysitting. Charlie Blue has been found with her sister from the beginning. It seems whatever she was doing; they shared the moment. Their connection is a special one on so many levels. Charlie Blue must see it her duty to watch out for her sister. She makes it her business to enjoy whatever they are doing together. Sometimes it is a walk, other times they are romping on the beach. When Mom cannot have her eye on things, Charlie Blue sees herself in charge. We have enjoyed watching these two friends play and grow up together. 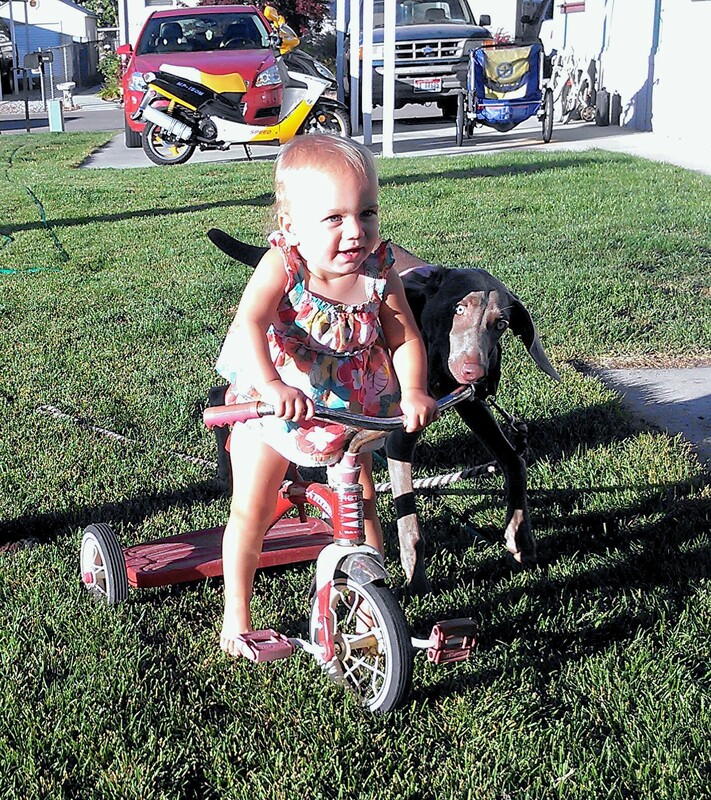 From being a toddler to riding her tricycle, and beyond–they are the best of friends. 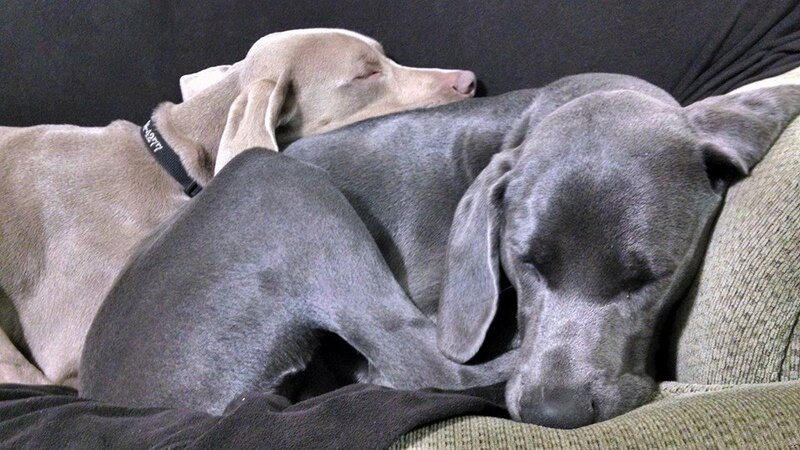 The Weimaraner is child-friendly when raised together. They are a favored hunting companion, but they do other things as well. Versatility means they are apt to swim (given the right encouragement). We are seeing more and more clients succeed with their Weims in the water. This is excellent. It is a very healthy activity which can burn off a lot of excess energy. Nevertheless, retrieving is not the only water activity. 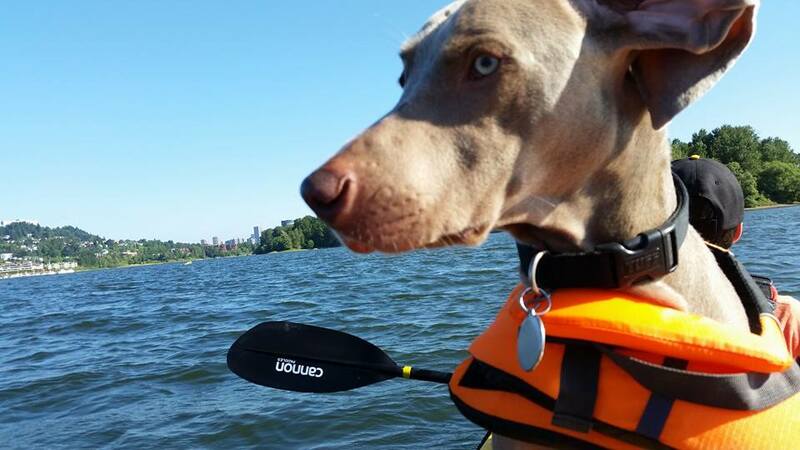 We are seeing a lot of Weims in kayaks, canoes, and on the water in general. It is really grand to see them with their family on (and in) the water. Waterfowl hunters like the versatile Weimaraner, but it is not the only water venue for this breed. They can find work by being on the lookout for icebergs, and other objects in the water. 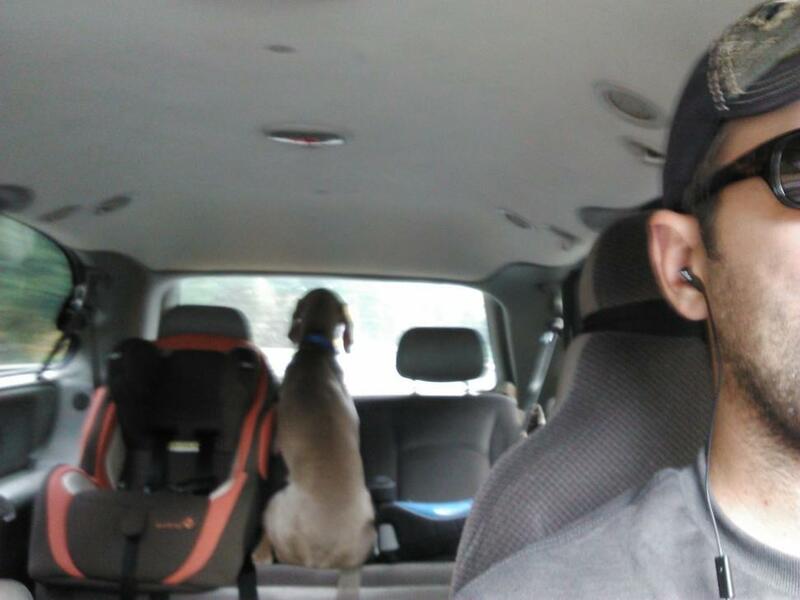 Finally, what road-trip, and weekend venture would be complete without the Weimaraner watching out for the other driver? There are countless other ways for the household Weimaraner to help with the workload. Last week, we featured Ruby helping with the laundry. Some clean counters (eke), and others pull weeds. They are known to be a great running companion. Their duties are a varied as the humans they care-take. It is nice to have a Weimaraner to share the labor.